A Little Something to Spice up the Office! If you are looking for a little something to spice up your office, we can help. Flowers are a great way to really bring your reception area, boardroom or office space to life. Talk to one of our experienced floral consultants and they can help you choose the perfect arrangement to liven up your office. We can deliver all around Australia. 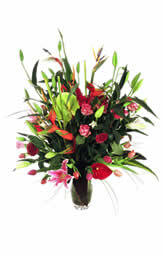 We can also set up a recurring flower delivery and automatically debit your credit card. That way you don't have to worry about a thing. Let us make sure that beautiful flowers appear as often as you specify. If you are looking for great gift ideas to send your employees for special occasions, make sure you contact one of our experienced floral consultants. We can help you select an appropriate gift. We can also send gifts to a database of employees if you wish ... just contact us for more details. If you are shopping with our network on a regular basis, you might want to look into setting up a corporate account. We can offer you discounts of up to 10% (Depending on volume). If you wish to know more about how we can work with you, please contact us.